Study with Aachan, Dr. James in Person! http://www.ThaiYogaCenter.Com Courses developed by Aachan, Anthony James are intended to take the principles of Thai Ayurveda (Traditional Thai Medicine and Indigenous Thai Traditional Massage: Thai Yoga/ Thai Massage) to a whole new level and understanding in the context of both traditional and modern medical ideas and techniques. With several advanced degrees in Western Medicine MD(AM), specializing in Native American, Indigenous and Traditional Medicine, Classical Indian Ayurveda, Oriental Medicine (Acupuncture) and Alternative Medicine and Naturopath (Traditional N.D.) (ANMA), Aachan James is uniquely qualified to bridge the gap between Thai Traditional and western health concepts. 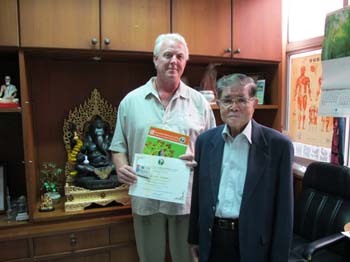 Aachan, Anthony James is also a Fellow of The International Alternative Medicine (FIAMA, 1999). Dr. Anthony B. James James currently holds both domestic and International medical licenses as a Doctor of Pastoral/ Clerical Medicine with the prestigious SMOKH/ SMOCH, NAIC. Dr. James is a Registered Ayurveda Doctor (AAPNA) and was Awarded the Veda Vyasa Award for Best Ayurveda textbook for 2017. As a traditional doctor, Indian Health Care Provider and healer of conscience he practices spiritually based natural medicine and Traditional Naturopathy (No Harmful or dangerous drugs and no surgery). Additionally, he is available for private consultations in the Natural Wellness Solutions Clinic located in The NAIC/ SCNM: Thai Yoga Center.